The new Honda X-Blade comes with muscular design and styling along with premium features like - full-LED headlamps, digital instrument console, and more. Honda Motorcycle and Scooter India (HMSI) recently commenced the dispatches for its all-new sporty naked street motorcycle, Honda X-Blade in the country. Introduced at a starting price of 78,500 (ex-showroom, Delhi), the bike is almost ₹ 4000 cheaper than the already on sale Honda CB Hornet 160R. 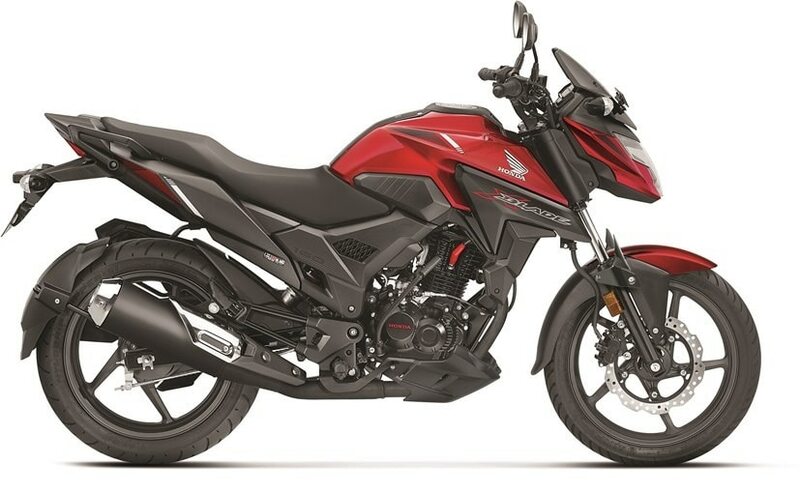 The new Honda X-Blade was officially unveiled at the Auto Expo 2018, and while there Honda did not reveal much about the new motorcycle, now we finally know all about the new bike, which will rival the likes of the TVS Apache RTR 160, Bajaj Pulsar NS160, and Suzuki Gixxer. Bookings for the X-Blade can be made all Honda dealers across the country for ₹ 5,000. The all-new Honda X-Blade is based on the company existing 160 cc street bike, the Honda CB Hornet 160R. The X-Blade gets the same chassis, same powertrain and even some identical cycle parts. The X-Blade gets what Honda calls a segment-first 'Robo-Face' LED headlamp. The full-LED headlamp setup comes with nine LED position lamps and promises to offer a brighter light throw than standard halogen lamps. Similarly, the rear comes with a sharp-looking LED tail lamp. Visually, the Honda X-Blade comes with a highly muscular profile thanks to the sculpted fuel tank with chiselled character, matte black tank shrouds, and the sharply designed grab rails. The bike also comes with sharply designed grab rails, a rear tyre hugger, dual outlet muffler with a chrome tip and the matte black side panels all add to the sporty look of the bike. The X-Blade will be available in 5 colours - Matte Marvel Blue Metallic / Matte Frozen Silver Metallic / Pearl Spartan Red / Pearl Igneous Black and Matte Marshal Green Metallic. Also, the dual tone finish adds to the overall look of the bike. The Honda X-Blade include a fully digital instrument console which shows service due indicator, digital clock and a gear position indicator. Sadly, like the Hornet, the X-Blade to misses-out on a kill switch, but Honda does offer a hazard light switch, which should be of immense use while riding through low-lit areas with bad visibility. Suspension duties on the Honda X-Blade are carried out by a pair of telescopic forks up front and monoshock suspension at the back. The bike runs on 17-inch wheels that are shod in tubeless tyres - 100 mm tyre up front and wider 130 mm rubber for the rear wheel. Braking duties are handled by a single 276 mm disc for the front wheel and 130 mm drum brake for the rear wheel. The bike does not get a disc brake for the rear wheel, nor Honda combi braking system (CBS), even as an option. Honda X-Blade is powered by the company's tried and tested 162.71 cc single-cylinder, air-cooled, 4 stroke engine, equipped with the company's HET tech, which churns out a maximum of 13.93 bhp at 8,500 rpm and develops a peak torque of 13.9 Nm at 6,000 rpm. The engine comes mated to a 5-speed gearbox and Honda says that the engine has been specifically designed to deliver good low and mid-range performance. The Honda X-Blade comes with a link-type gear shifter, which the company says helps in precise and smooth shifts.